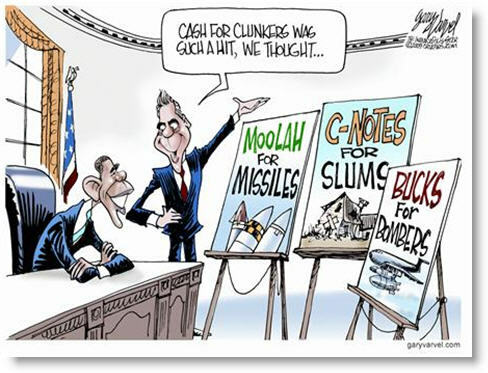 Home › Government Failures › Cash For Clunkers › Cash For Clunkers – I was right, they were wrong. 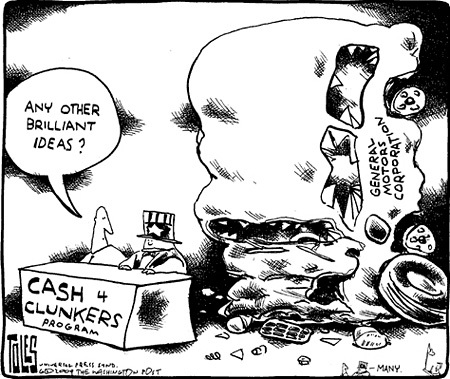 Cash For Clunkers – I was right, they were wrong. Kudos to Mr. Leonard. His was one of the few articles that admitted the frothy excitement of how Cash-For-Clunkers would rescue us from oblivion were logically and economically unfounded. The damage has been done, here is the analysis. I for one, do NOT need any more government help. With the kind of help the government gives me, I’ll be in a cardboard box under the freeway in a matter of months. The italicized statements below were my predictions of the damage the Cash-For-Clunkers program would cause. I followed my prediction with a relevant article and statements confirming the unfortunate reality. Used car prices go up, hurting lower income families. An Oct 7 article in the N.Y. Times stated, “Used vehicle prices shot to an all-time high last month, spurred by falling inventories…this summer’s wildly popular Cash for Clunkers program sent new vehicle sales soaring, taking dealers by surprise and clearing out inventories.” This affects the poor and the middle class disproportionately. Used car sales go down, hurting used car dealers. Used car sales did in fact drop 30% or more at used car dealerships, which tend to be local mom and pop businesses, affecting their families livlihood. “We’re struggling and a lot of us small guys are going out of business,” said James Dameron, sales and finance manager at Chase Motors in suburban Richmond. Future sales are cannibalized for current sales. New car prices go up, putting buyers off into the future. Used car repair owners/mechanics suffer from fewer repairs. The Fairfax Times in Virginia reports that local repair shops are down in revenue and customers due to the Cash-For-Clunkers program. “Cash for Clunkers is bad news for Bill Wiygul, whose family owns several automotive repair shops in northern Virginia. Business was booming, in part because of an economy that forced many consumers to hold on to their older vehicles and keep them up in lieu of spending much-needed money on newer models.” Mr. Wiygul went on to say he’s most infuriated with the fact that the government is supporting one segment of the auto industry over another, namely GM due to the government’s financial ownership in that company.